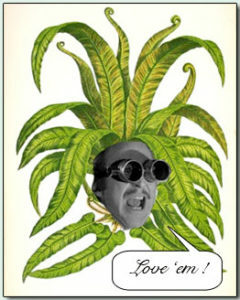 Today, you are a member of... Pteridomania (or something of that ilk) - You Are A Member! The Victorian Age has so much to offer us, members. Those weirdos, with their gargantuan inner conflicts and Dickensian disparities couldn’t help but develop the most bizarre interests. Take Pteridomania – a wildly enthusiastic love of ferns inspiring collectors from across all social classes to go a-hunting for that seedless, flowerless botanical wonder. Fern motifs were rife and fern societies sprun up everywhere. There even was a special enclosure called a Wardian Case, invented so all that coal and sulfur wouldn’t kill your killer collection. This week a bit of pteridomania awaits ye members, so make like a Victorian. Get dainty, get contradictory, and build an empire of odd interests.